All the themes which are showcasing in this list and will be in other forthcoming collections have a fully responsive layout. 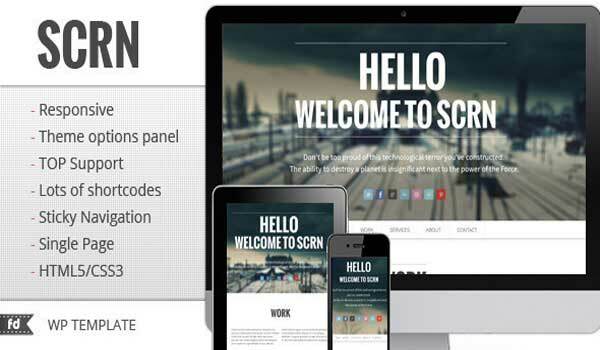 These responsive WordPress themes fit perfectly on various displays and resolutions from regular desktop screens to tablets, iPads, iPhones and small mobile devices. Feel free to try it out! 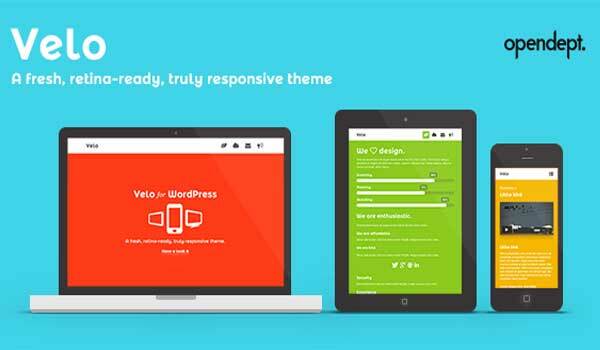 After choosing a responsive WordPress theme your website will display beautifully and intuitively on all devices. These themes use CSS media queries to trigger different layout sets at various screen sizes. We are preparing another part of best responsive WordPress themes because of huge quantity of showed up responsive WordPress themes here on functionthemes.com. Do not miss that nowadays business exploding or just simple portfolio website creating could not start without a website design with a responsive feature. 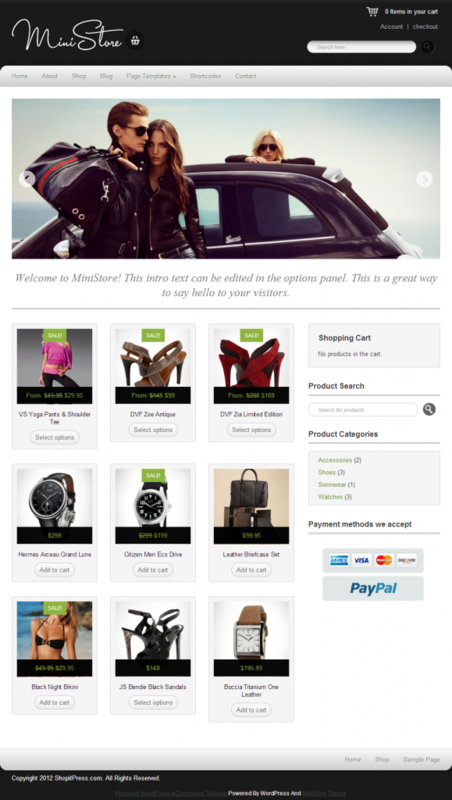 Ministore is free premium eCommerce WordPress Theme. This theme eCommerce functionality is provided by WooCommerce plugin. Theme works with latest WordPress and WooCommerce releases. This WordPress theme is responsive that has four pages: a cover page and three pages in the inner site that has styled scrollbars. This vCard WordPress Theme style will help you to create very professional and nice looking personal portfolio website and internet resume. This theme is interactive and unique in its own way that has unlimited foreground plus some parallax layers for its background for a complete responsive layout that is created using the framework Bootstrap version 2.3. Its parallax layers has no limit to its horizontal and vertical scroll effect. Perfect for any portfolio website but recommended for photography. This one page WordPress theme will fit great for people who wants to have awesome portfolio site. Eleven has the parallax effect to its only one page for a template. Since it is only a single page theme, it is easy to customize and perfect for photography portfolio. It can also be for any type of purpose like corporate, business or digital agency. A visually stunning yet simple theme that has a very striking one page template for website. It has a support for Retina screens and the icons are even for Retina displays. Perfect for any type of who wants to make use of this theme. It is also a responsive theme, which means that it perfectly fits any resolution on any mobile device. If you want a no-mess theme, this is the one for you. This modern and functional design is one of the best choice for the restaurants, pubs, bars, wineries and other companies offering foods and drinks. Well structured and fitted for all search engines Linguini theme let you create menus, events, photo galleries and video galleries in the easiest way. This responsive theme helps to adapt display for all devices and is suitable for resizing of your browser window. All the restaurant owners and operators would be satisfied to manage and promote their restaurant business with this responsive Linguini theme. If you are developing restaurant business, you have found the best design decision for your website already. This clear and functional design is well structured and fascinate by its own simplicity. Main welcoming page, uploaded menu, table reservation form and contact information below the page of this restaurant WordPress theme could be all what you need for successful promoting and expansion of your business. 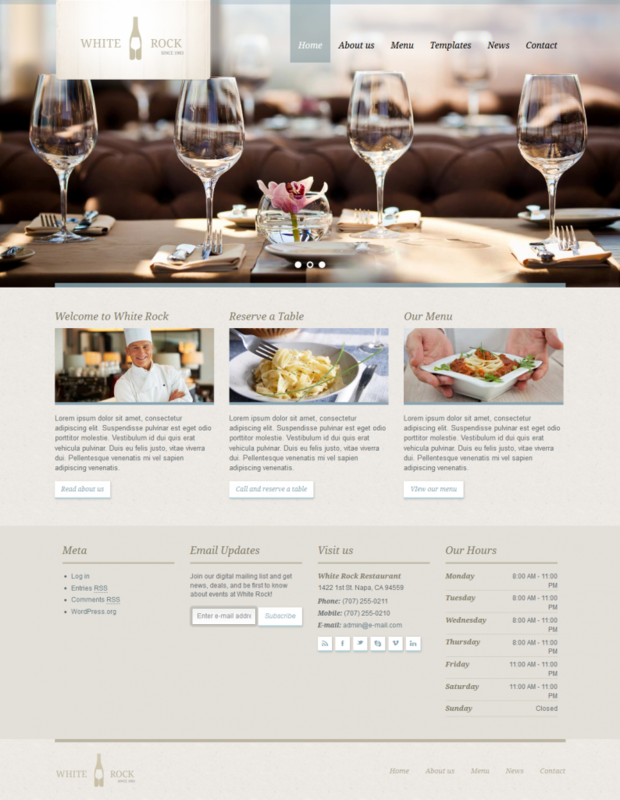 White Rock is the responsive and attractive restaurant WordPress theme that contains all you need in one place. Another responsive theme that is perfect for any portfolio projects like creative agencies, designers, photographer or freelancers. Its stunning layout capabilities and design gives flavor to your portfolio and the attention it needs from every audience it deserve. This theme has garnered much praise from those who has used it. Bistro is a classic and elegant theme. 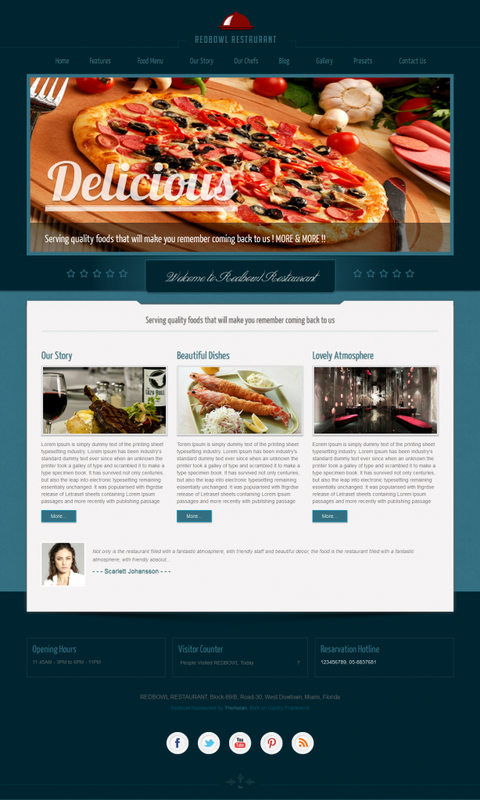 This restaurant WordPress theme suitable for restaurant, food, cafe, business and portfolio sites. It’s very easy to use even for beginner. Equipped with custom post “menu” and calendar for all your events. This theme also highly customized, you can change website look just by clicks. This functional restaurant WordPress theme is a very powerful theme with many features easy to edit for both, users without programming knowledge and for developers. With its premium design, LemonChili template has been specially crafted for a restaurant or coffee shop website but it can easily be customized for a pastry, catering or recipes portal. Each page has unique layout created to best display data in well organized and visually attractive way. Clean and creative design is planned into details to make your meals and restaurant offer leave outstanding impression on visitors. Another one page theme that has a lot of features and options to customize the theme. This also has the parallax feature on its one page WordPress theme. 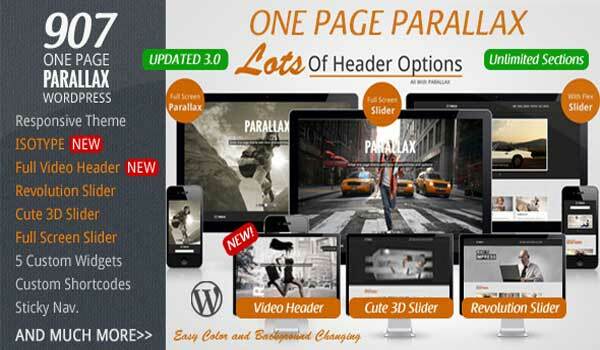 This one page WordPress theme also gives you a default parallax feature option. A retina ready, responsive portoflio theme suited for any purpose. Great for showing off your work to the world such as photography, illustration or any kind of creative work you have. With the help of its responsive feature your site will have a very stunning touch to any device such as the mobile phone. 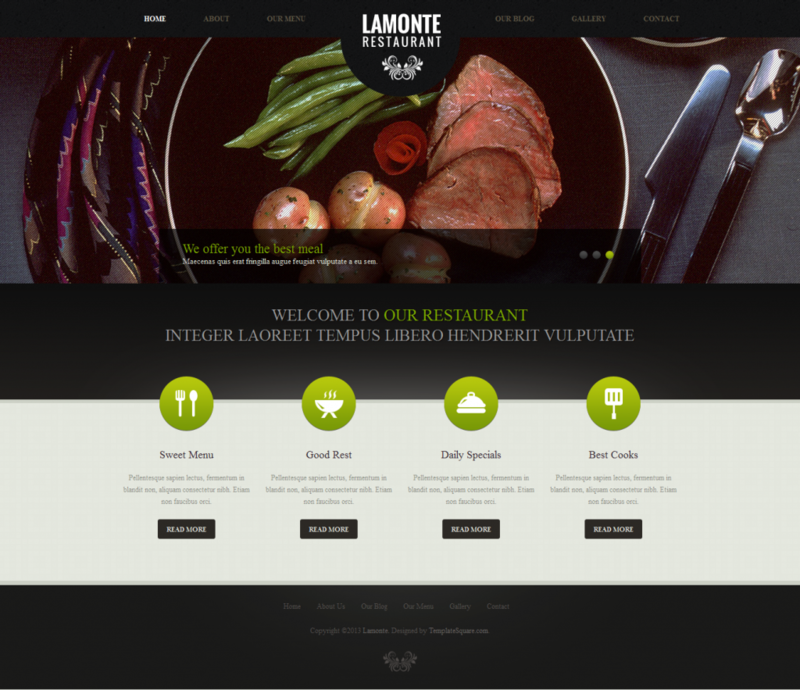 LaMonte is an elegant and unique template, which will be ideally suitable for any sites related with restaurant and bar. 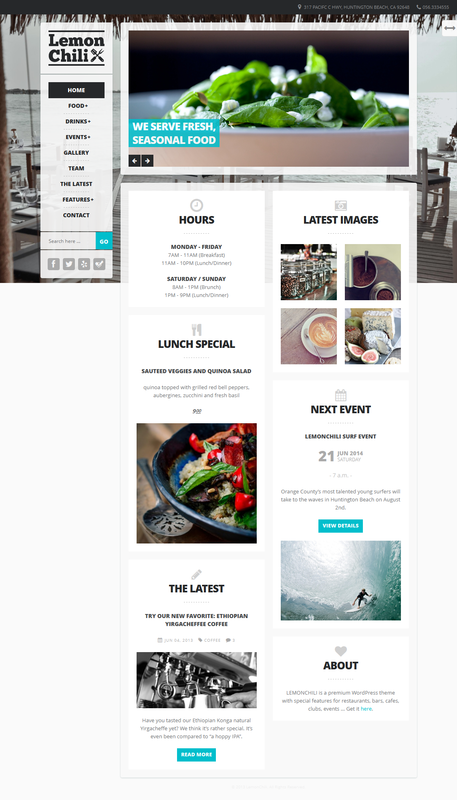 You can this restaurant WordPress theme edit, modify to be suitable for your needs. Clean and creative design is planned into details to make your meals and restaurant offer leave outstanding impression on visitors. Each page has unique layout created to best display data in well organized and visually attractive way. 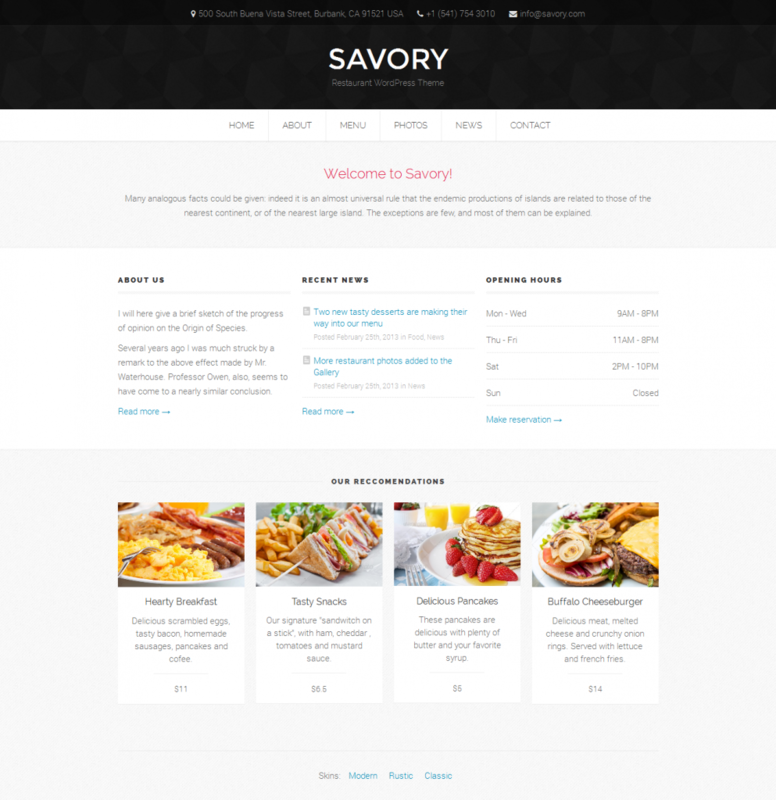 Savory is a WordPress theme specially designed for restaurants, diners, bars, pizzerias, coffee shops websites. This template is easy to modify and ready to be up and running out of the box. Each page has unique layout created to best display data in well organized and visually attractive way. Simply impress your audience with this fully featured Photoshop Design. This is a premium responsive restaurant WordPress theme. Customize this anyway you like. This template includes menus that have prices, a blog section, custom treatments below the page and an image gallery that conforms to the look of pictures. You have to fill up this theme with a minimum of an information about your business to look it attractive and inviting to try your delicious food. 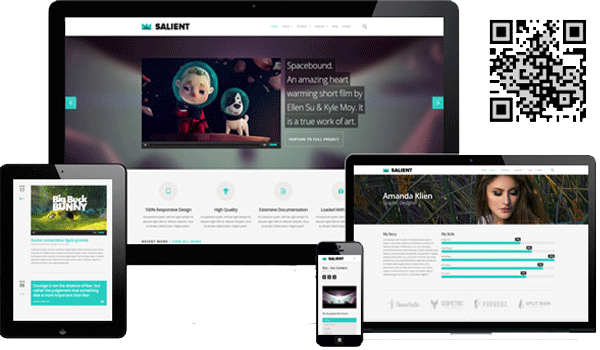 A responsive design theme that is perfect for the creative work. 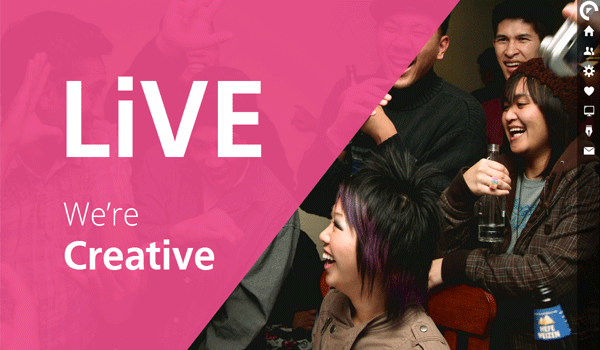 This was created in mind to put the user’s work at the forefront which showcases all your creativity to the world. 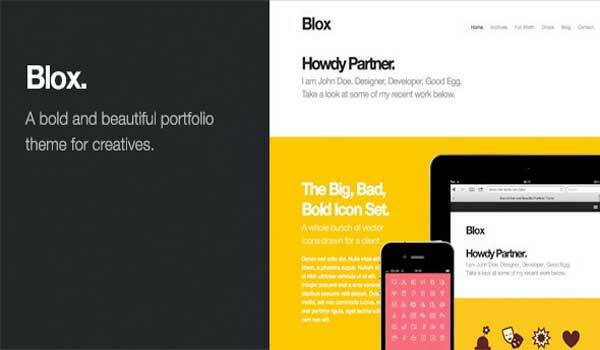 Each portfolio you place in this theme has its own ‘block’ added with creative design. Another single page portfolio wordpress theme. 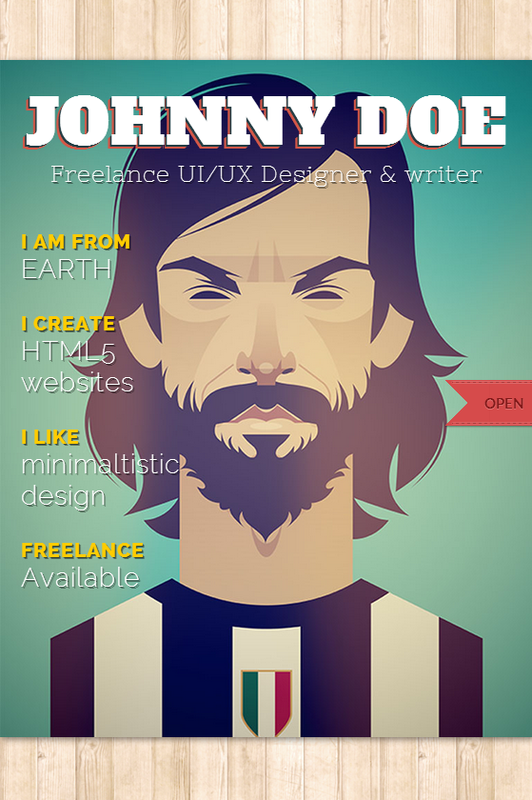 This theme is a good choice in promoting your creative work or the business that you just recently opened. Good for any latest mobile devices that are out in the market today. It has a blog space despite its minimalistic design. It has also been recently updated to support videos. Photolux is a modern, responsive and functional Portfolio and Photography WordPress Theme which is best suited for photographers and creatives who use portfolios to showcase their work. 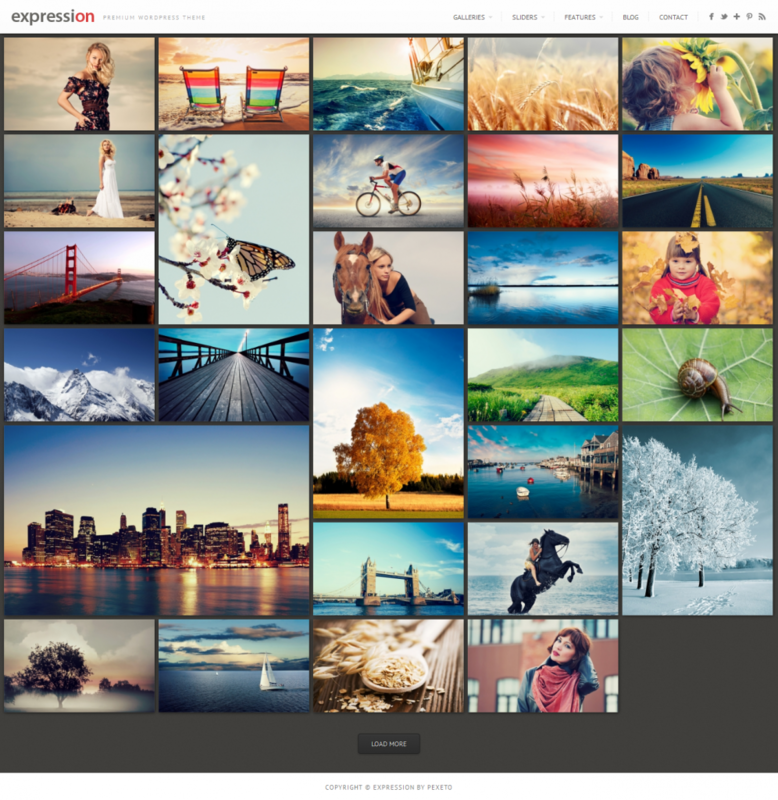 Photolux theme is powered by the advanced Pexeto Panel, which provides different options to manage and modify any aspect of the theme. It is well suited for both beginners with no coding knowledge and developers. The theme comes with three base skin choices: Dark, Light and Transparent, as well as numerous of back-end options for easy customization and building your skin. The theme is responsive, so that it fits and looks great on different nowadays devices – desktop, mobile phones and tablets. Detailed documentation is attached too. Invictus is an original photography template which provides the user with a minimalistic look and a modern unlimited color palette. However, this theme can be used in many other areas such as web design, video production field and so on. This photography WordPress theme provides tons of options to manage and modify any aspect of the theme. It is fully compatible with mobile devices and it contains many options that will make it easy to customize to fit your needs. Try it and be satisfied with your business or hobby much more! Expression is a photography WordPress theme which would help you to express what was waiting for ages! Is your business or hobby contained from different beautiful snapshots or videos? We have found for you the best solution to showcase your treasures to others. This well structured, modern, simply beautiful photography WordPress theme is easy to use and contains the main features were built with all the programming standards of WordPress. If you were looking for unlimited gallery pages, social sharing tools, easy slider navigation, you have found the best option to you. Enjoy!